The current-generation Toyota Tacoma has been with us since the 2016 model year, but with vehicles like the 2019 Ford Ranger and 2020 Jeep Gladiator now entering the segment, it’s no surprise that Toyota is stepping up its game to compete. Here’s a look at the refreshed 2020 Toyota Tacoma. It doesn’t look like there’s a particularly dramatic styling refresh on either the exterior or the interior, but Toyota does point out in its press release that “nearly all” 2020 models get a redesigned front grille and wheels that are either new or revised. Some other changes to certain trims include new LED daytime running lights, LED fog lamps, LED headlights, an LED bed lamp, redesigned taillights with either darker housings or chrome or black inserts, and revised seat-back fabric. The bigger changes deal with the gadgetry on the inside. SR5 trims and up now get a new 10-way power adjustable driver’s seat with lumbar support, and all Taco models get an upgraded infotainment system with a bigger touchscreen. That multimedia system, Toyota says, will have Android Auto, Apple CarPlay and Amazon Alexa capability, and will be mated with an upgraded 7-inch infotainment screen on the base SR modes or with a bigger 8-inch display on SR5 trims and up. 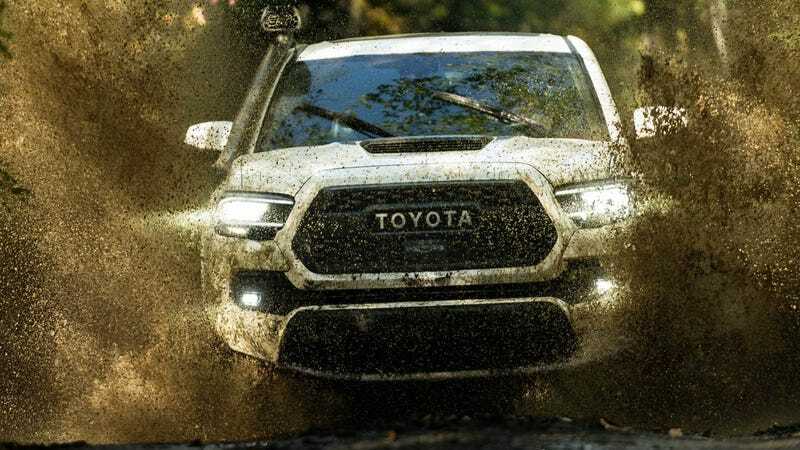 The 2020 Toyota Tacoma TRD Pro trim, in particular, gets unique sequential LED/DRL headlamps; a new, lighter 16-inch wheel design; taillamps with black inserts; and standard Panoramic View Monitor (which is standard on the Limited trim as well,) and Multi Terrain Monitor, which use cameras to help the driver see the trail. Toyota mentions that it’s “updated the tuning” on the Fox 2.5-inch internal bypass shocks on the TRD Pro, and did the same to the front and rear springs.